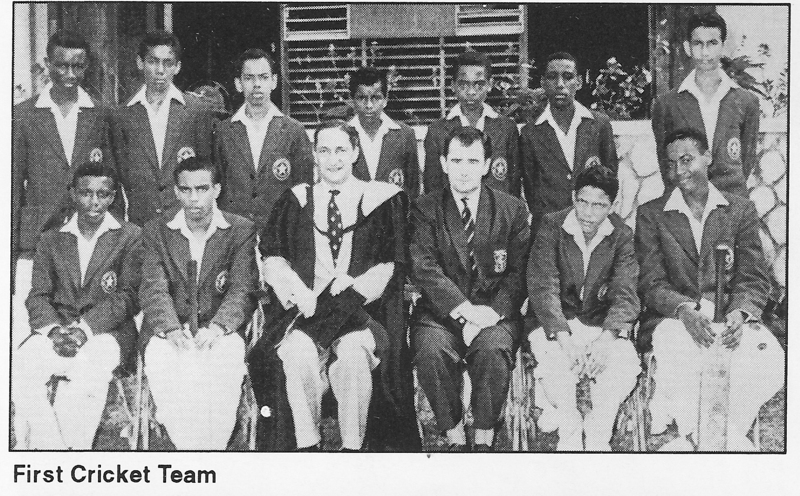 Rear L-R: Henrick Hamilton, Jean Royale, Neil Myrie,Sammy ?, Errol Latty, Peter Boxer. 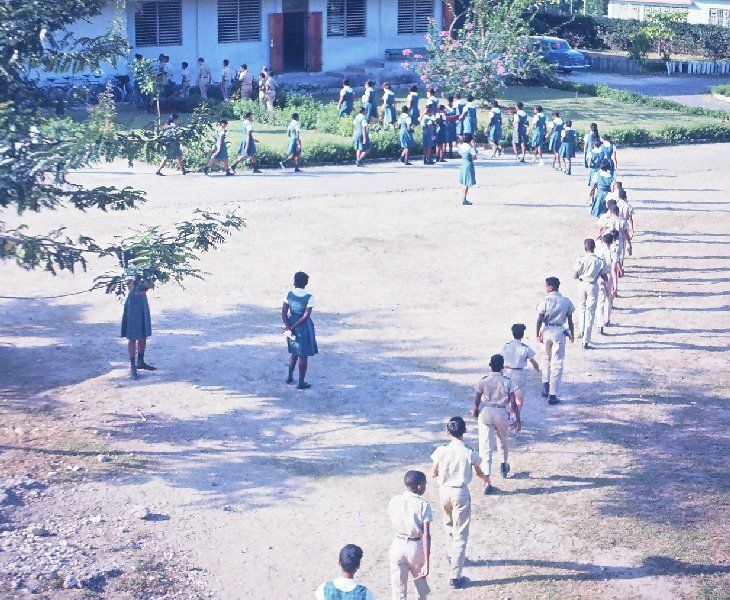 The March into the Assembly Hall each morning . The Prefects watched from the sidelines liked hawks, and the consequence for not wearing the correct uniform was an hour's detention after school that day. In this photo you can see members of the Meadowbrook High School Cadet unit. 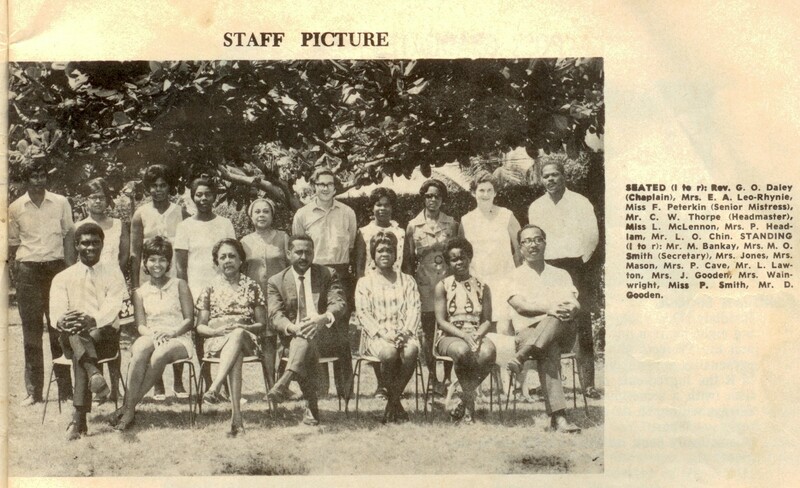 L-R: Cynthia Smith (RIP), Donna Whyte-Philibert, Donna Williams, Maurie Malcolm, Andrea King-Bird, Karlene Gardner, Audrey Jackson-Lee, (Owen) Loren Oliver, Sharon Taylor, Keith White, John Richards. 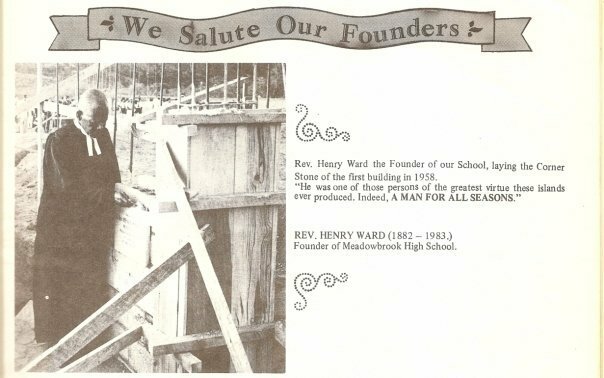 Reverend Madge Saunders, one of the co-founders of Meadowbrook High School, not only had this dream but along with Reverend Henry Ward made it a reality. A line from the school song, “The meadow and the brook once claimed the sphere” clearly depicted the setting or environment which existed before the community and school became a reality. 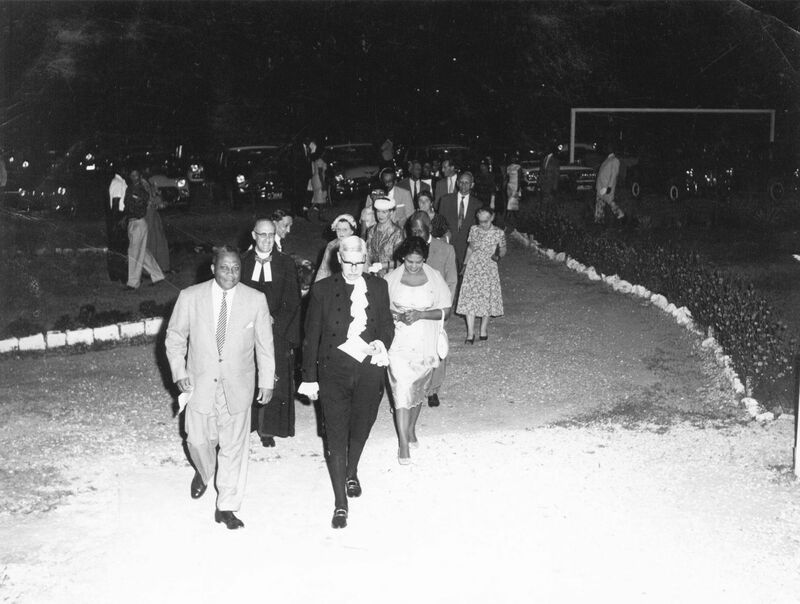 It was said that Reverend Ward beheld the semi-wilderness of the Meadowbrook area and saw the need for a school. 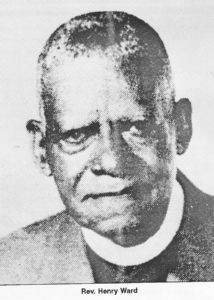 Being a man of “insight, courage, dignity, a dreamer and visionary” he along with Reverend Madge Saunders was determined that the school should become a reality. Who was Reverend Saunders? One documented script records her as “a cheerful, zealous spirit”. 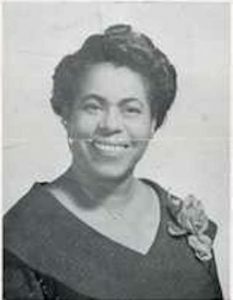 History also documents her as a graduate of Bethlehem Teachers’ College, one who loved children and desired to see them attain great heights. Starting the school became an integral part of her being and her constant dream. 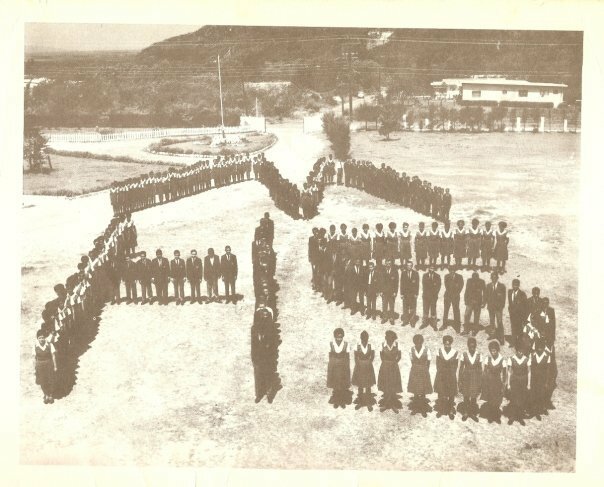 They both pursued this dream and on January 21, 1958 the land was dedicated and in September the school began with twenty six (26) students and five (5) teachers, including the first principal, Mrs. Margaret Gartshore, then recently retired principal of St. Andrew High School. 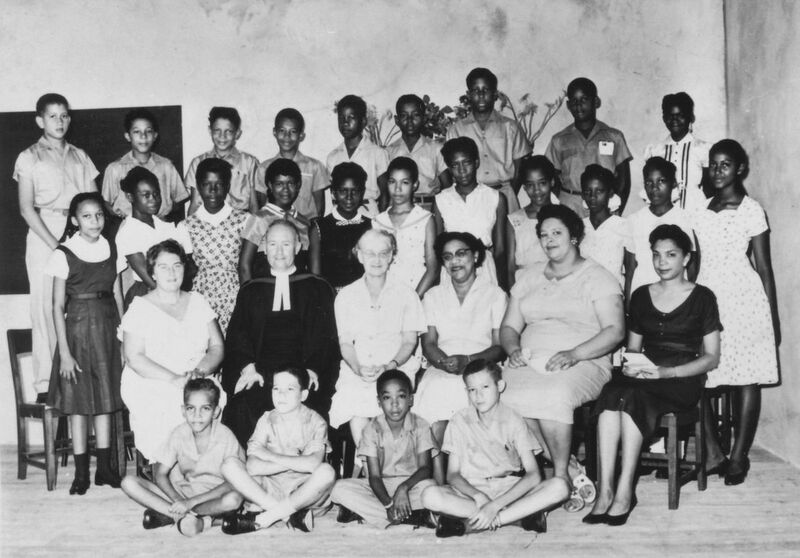 This marked not only the beginning of the school but the beginning of Meadowbrook United Church. The auditorium was the first building erected and was used as classrooms during the week and a church building on Sundays. The auditorium housed the entire school with offices being upstairs. In the early years a tartan plaid was selected for the girls’ uniform as a result of the firm bond between Jamaica and the Scottish Presbyterian. At first, the formal dress of the girls was white dress with a cummerbund but this was later replaced by the plaid sash across the bust. The boys’ formal dress was blue blazer and grey pants. 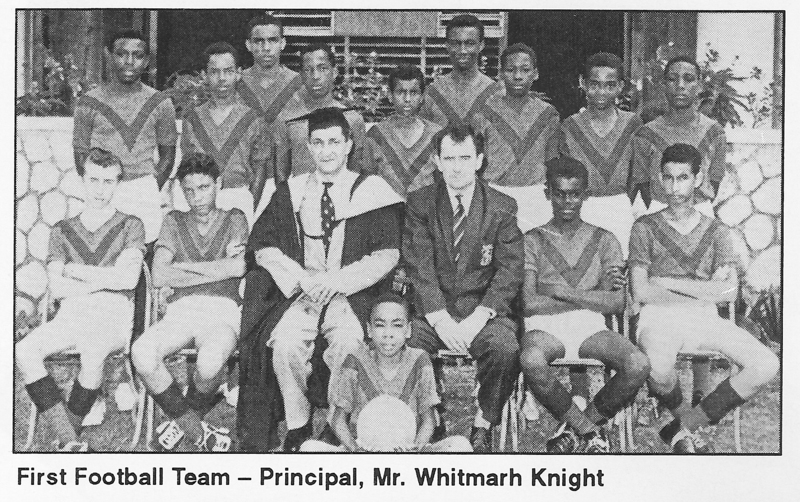 It is interesting to note that in the 1960’s during Mr. Whitmarsh Knight’s tenure as principal was marked by strict discipline and formality in dress; teachers wore academic gown and caps even on hot days. The first principal was Miss Gartshore whose dedication and immense experience were instrumental in setting the school on a firm Christian path was followed by subsequent principals. Not only did Christian ideals grow but also the school’s population and by 1960 it boasted 132 students and became a grant aided institution which boasted a sixth form. 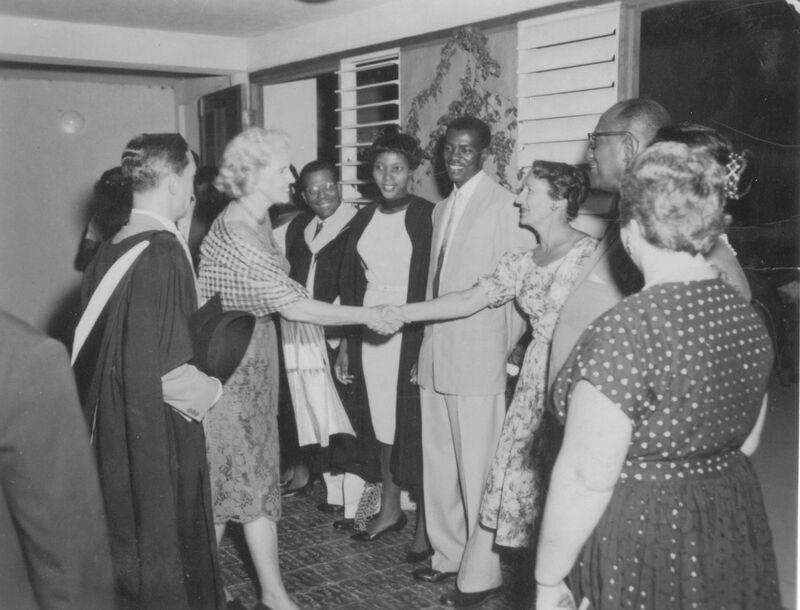 The growth spilled over into other areas of the school and a three storey block consisting of six classrooms and science laboratories were erected and opened by the then Minister of Education, Honourable Florizel Glasspole. Over the years, the school has added blocks for grades eight to thirteen along with the library, other science laboratories and a canteen. The school’s population has grown significantly to approximately 1450 students and 75 staff members. Today, Meadowbrook’s growth is not only seen in buildings and numbers but in academics and a few areas in sport. Our past students are to be found in every professional area, nursing, teaching, medicine, law, aviation, sports, banking and commerce; just think of the profession and Meadowbrook is accounted for. 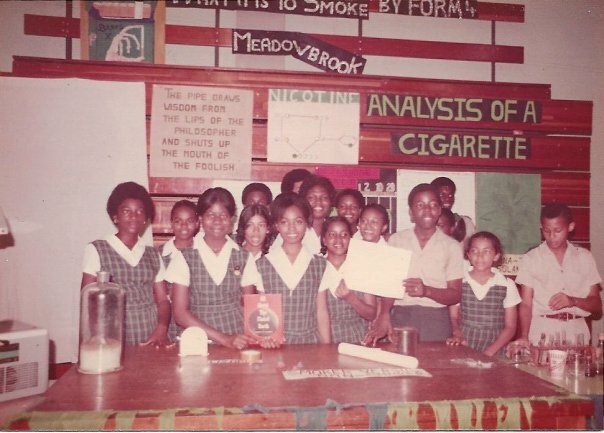 One of the hallmarks of Meadowbrook’s achievement occurred in 1994 when the country woke up to the stunning news on August 14 as reported by the The Daily Gleaner that “Meadowbrook is Tops!”. This was as a result of an all island academic survey carried out on behalf of UNESCO. Ratings as regards high schools achievement in the CSEC examinations are done annually and in many instances Meadowbrook High School was placed in the top twenty. However, over the years, there has been a fluctuation in these ratings. On February 29, 2016; The Gleaner published an article entitled “Meadowbrook Makes Big Jump in High School Rankings”. The details attested to the fact that the school had made the biggest improvement in this year’s CSEC IVY League Rankings. This was based on the percentage of students who graduated from grade 11 with at least five CSEC subjects including Mathematics or English Language.